Hey everyone I have designed a simple K-Cup holder for a Kuerig K45 Coffee Machine and decided to share it with you. I have designed it in Sketch Up and have posted the pictures here in this post. If you would like the .skp file to use in Sketch Up on your machine just email and I will send it to you. I have just gotten one myself and love it because of the one cup at a time and the seemingly infinite number of flavors. I used box joints for the top and a simple dado groove for the bottom of the actual box. The reason I did that is I saw no need to make box joints on all 4 corners when the bottom will not even be seen where it is placed on the counter but obviously it would be just as easy to add them to the bottom if you would like. So the basic dimensions allow for the Kuerig to sit on top and it has some extra space for a basket of other things you may want like sugar or spoons or you could even store a couple of cups if you would like. The wood that I used was some very old redwood and will not use that again for such a purpose because of how dry it is and when I started I thought it would be much harder. It is actually a very soft wood and in some aspects difficult for me at least to get a tight fit on the joints. There is some real finesse and patience needed to work with this wood both of which I have a limited supply of! I picked up this wood awhile back when a friend was doing some remodeling of there home. This is actually siding from underneath the siding they were tearing off to change. A very unexpected and cool find. So I got the call and took a drive over but was beaten to the punch by another of there friends who had gotten there just before me. Luckily enough I was able to dumpster dive and salvage a few good pieces. I wish I had 10 more pieces to make a table top because this stuff is a 80 years old I think and very beautiful. I am happy just to have the pieces that I do because I have heard that this is difficult wood to get a hold of these days. So building this project I learned how to get better fitting box joints. I am on a quest to get better at doing small projects with different joinery all with hand tools to make my woodworking skills better. I think that by doing these projects with hand tools it is going to force me to slow down and take the time to really understand what I am doing and the reason that one uses a certain type of joinery over another. Plus I think it will increase my patience and help me to slow down. Something I have been striving to do because I have been realizing that most if not all of my mistakes are from rushing through these things and not taking the time to get it just right. I say to myself all the time that no one will notice or don’t worry about it just get it done! So here are some details on how we would build this. People with the Sketch Up file can generate a cut list with the plug in “Cut List” available on the Sketch Up site. My first step was to get my wood prepared. I took some planks that were all different widths and milled them to the same thickness. These planks were 1″ x 8″ x 10′. 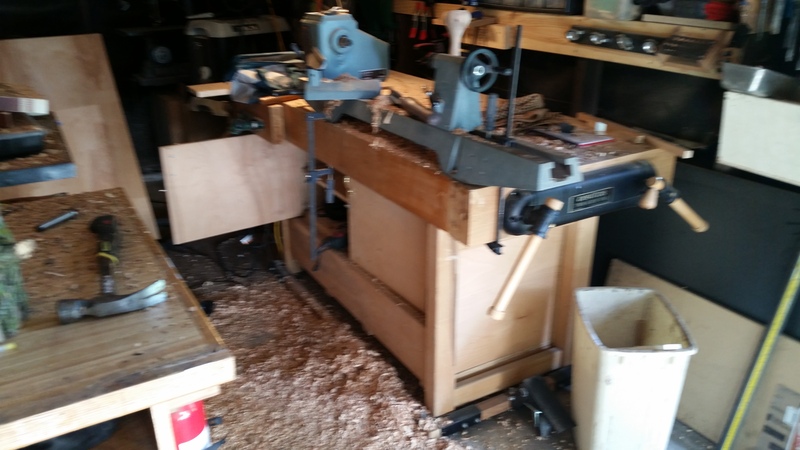 I wanted the box to be 12 1/2″ x 13″ so the actual width allowed for some easy milling to size. This I did by running the planks through the table saw for each side lengthwise. This allowed for a nice straight cut parallel to each other. I then cut them close to length for all my needed pieces on my small table saw sled. Next we have to get the pieces the same thickness so we do that by putting them through the planner. (Just a note here on the planning.) I could have run these through in one length first but I think it easier to get close to the actual size of all the pieces needed and then run them through. For me it is easier to handle the smaller lengths and I think it saves any unnecessary planning of wood that will not be used in the project and wear the blades unnecessarily. I do leave all the pieces an inch or two long in case there is any snipe. Snipe is basically any beginning or ending deeper planning marks caused by the entrance or exit of the board from the knives. No matter what you do sometimes this just happens. We then put the boards on the bench and make sure we have the amount needed and all the boards are the same thickness in case we did forget one! At this point I like to plan out my glue up and see which sides look best together. I take four pieces and glue 2 together for the top and two together for the bottom. I take all the rest of the pieces and dimension all of them at the table saw. After the top and bottom plates are dry I dimension them as well. Now is the time to do your joinery. I chose box joints for the top with very large pins at that. The reasoning behind this is I wanted to do them by hand and need tons of practice so to put pins at half inch centers seemed like I was asking for trouble having to be more precise. I know I need more practice but I didn’t want to fail either by making it unnecessarily hard. You can of course center yours anyway you see fit. I believe that when the strength is not needed we can use aesthetic value as our guide or in my case practice! Let’s not forget our dado for the bottom of our sides at bottom plate. Simple grooves done at the table saw. Just use half the thickness of you wood as your guide and sneak up on it with a scrap piece and they will fit perfect! If you notice for the back panel there is also a dado need so the back is not seen from the side view. You can do this on the table saw for the top and bottom but the sides need to be done with and router plane as in my case. (the hand tool thing again) Or perfectly easy to do with a router. All you have to worry about is stopping just before the end and cleaning and squaring up that portion with a chisel. Now we need to go to the scroll saw with our 1/4″ plywood piece to cut out our letters. I used a piece of paper printed out from my computer and cut that out, not perfect just close, so I could spray glue it to the plywood for a template. If you do not have a scroll saw any hobby store sells pre made letters for very cheap and then it’s just a matter of painting and gluing them on when the project is finished. I glue and then pin it. At this point we can get to the glue up after some sanding that I like to do just to clean up any plane marks or table saw marks. I have a grooved table saw top so I frequently get some marking from it. Format ImagePosted on March 11, 2015 March 16, 2015 Categories New, WoodworkingTags Free plans, sketch up, woodworkingLeave a comment on Keurig K-45 K-cup Shelf with Drawer. Best Ever IPad Case V.2! 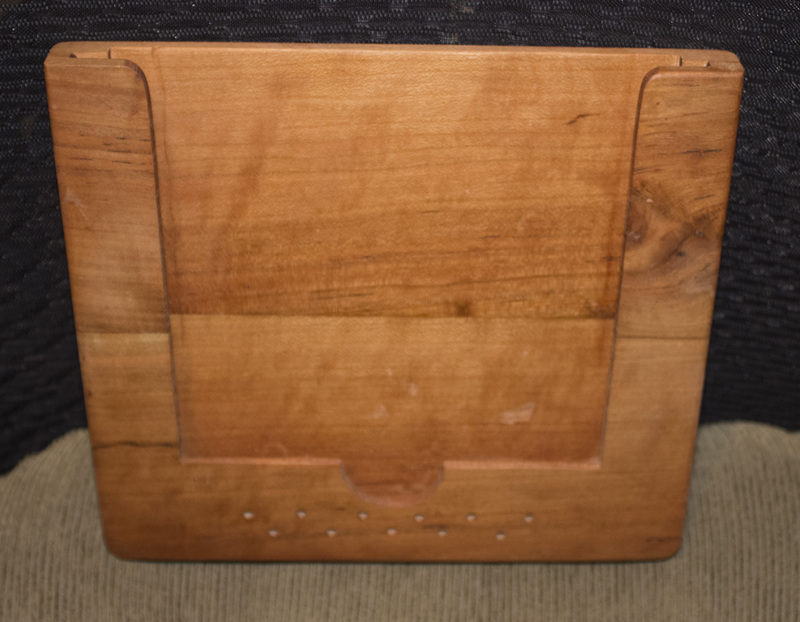 Format ImagePosted on January 30, 2015 January 31, 2015 Categories NewTags iPad, Ipad Holder, sketch up, woodworkingLeave a comment on Best Ever IPad Case V.2! I have been making versions of an iPad holder. I have totally finished none of them so far! As for the pics remember this is the first mock up so there are plenty of imperfections. In a mock up I am not so worried about mistakes with the router going to deep or things like that. This was a good chance to practice free hand techniques with my Colt size router that I normally always use with a straight edge or template. I have made three attempts at this and have still not come up with a design that I am comfortable with. My thinking on this is that I want it to be light but made out of wood and I want to have an area for the speakers to be redirected from facing down to forward. The first version is the best so far but the subsequent two are terrible. I am wondering to myself how I got so far off the mark when the first one was so close! The first one is picture here and the speaker redirection was very simple. Just a cavity and then holes drilled to let the sound escape. It works surprisingly well. One mistake that I have made through this whole process is that I have been just winging it. I should have at least did a simple sketch an being the fan I am of Sketch Up I should have started there. I know the troubles I am having with the last iteration of the holder would have been noticed if I drew it first there in 3D. So thats what I am going to do! Wish me Luck! I have shot a tour video of my one car garage shop and I hope you all enjoy it. Here is the link to that video https://www.youtube.com. If you do not like it and think I can do better please drop me a note and let me know what you are thinking. If you like it then please subscribe and hit the like button for me on my You Tube channel page. These are the first few videos I have done and I hope to get better at this. I really enjoy doing them but I have run across a little snag as of late which has hampered my shooting of more videos. I have had a back surgery and it has pretty much stopped me from doing much at all. I am thinking that I would like to do more sketch up videos because I can do those sitting down. If you all would want something in particular just let me know and I will work on it for you. Thanks for stopping by and as always “If I can do it than so can you”! This is my first You Tube video! Hopefully there will be plenty more to come on a weekly basis. I decided to do this as my first video because it is a very important tool in my shop. This is where it all starts with any project I do. By starting here and getting my idea or sketch into a printable drawing with dimensions is by far the biggest time saver that I have. I remember long stretches circling the shop or just sitting there thinking what the next move was or how I was going to fix the wrongly cut piece laughing quietly laying before me on my bench. Another plus with 3D programs is that you get a feel for how it will really look and a better sense of it’s scale. If a leg looks to fat to thin or the top has to long of an overhang. Then again this can be the exact reason why you need a program like this. You want to break all the rules and are looking at this thing you just drew on your work top bench thinking this is just not right, but….. All your senses and artistic intuition is telling you that it’s right it will be gorgeous! That’s when Sketch up steps in and really shines. You can model that piece to your specific dimensions or it can be scaled to that perfect awkward, breaking all the rules masterpiece. The perfect piece that was blinding you the night before as you lay awake trying to work out the math. If you can not tell I am a big fan of Sketch Up. By no means am I a proficient user. I am just beginning to break into all the potential this program holds. I think that is a major reason why I am incorporating a section on my channel to Sketch Up is because it will help me to learn and become a capable user. Or I may just end up looking like an idiot. This is the part you get to decide. I hope it will be the firmer and you will be a happy subscriber who keeps returning to see what is coming up next week. Thanks for stopping by and as always “If I can do it so can you”! Posted on June 26, 2014 July 10, 2014 Categories Computer, Off TopicTags sketch up, tools, tutorials, woodworking, you tubeLeave a comment on Post Surgery!